I always thought Tim Hortons was more like something between McDonald’s and Applebees. This photo makes them look more like a McDonald’s. 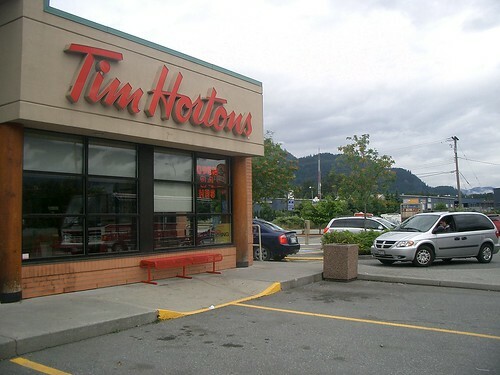 Timmy’s is a doughnut and coffee establishment; they also offer a small selection of soups and sandwiches. Tim Horton’s is a fast food restaurant that despite having been bought out by Wendy’s remains a quintessentially Canadian entity. It remains pretty cheap and reliable, and the food is a lot better than at most other fast food joints. And…I rather like their honey whole wheat bagels. Think Dunkin’ Donuts, but with a broader menu selection and longer lines. It’s quite popular.